For Rick Steves Classroom Europe, I've selected the most teachable moments from my Rick Steves' Europe TV shows, and broken them into short video clips for teachers to use in the classroom. I appreciate the challenges educators have, especially these days, and the passion they have for inspiring their students to learn. This project is a joy for me to offer and a small way of saying "thank you" to our teachers. March 18, 2019, Edmonds, Wash — Rick Steves recently launched a new online resource for teachers and students — Rick Steves Classroom Europe™. This free video library is packed with more than 400 teachable video clips curated from Rick Steves' Europe TV episodes. Teachers can search the video database, select any number of short clips, and build playlists to enhance their lesson plans. It's fast, fun, easy…and totally free. "I believe that the future stability, security, and prosperity of our nation depends on our education system — and that depends on our teachers," says Steves. "To thank and empower them, for years I've been working on this idea. And it's finally here." 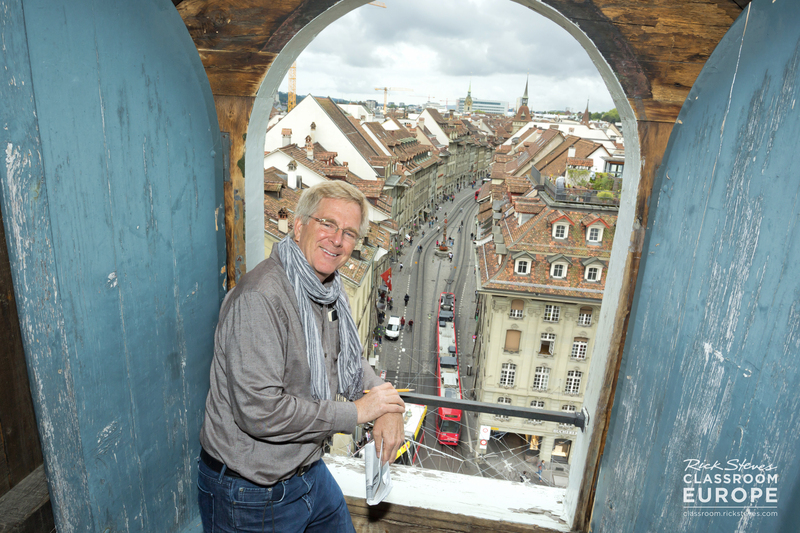 For Rick Steves Classroom Europe, Rick personally selected his most teachable moments. These short video clips (mostly three to five minutes) cover a vast range of topics: From touring the ancient Roman Forum to learning why people in Barcelona speak Catalan, to visiting a vibrant market in the south of France, to pondering why pilgrims trek 30 days across northern Spain to Santiago de Compostela. This ad-free site contains hundreds of such short and engaging clips. Steves says, "I appreciate the passion teachers have for inspiring their students to learn. This project is a joy for me to offer and my small way of saying thank you." All are welcome to visit classroom.ricksteves.com and enjoy. Guidebook author and travel TV host Rick Steves is America's most respected authority on European travel. In 1976, he started his business, Rick Steves' Europe, with its headquarters in Edmonds, Washington, near Seattle. There he produces a best-selling guidebook series on European travel, America's most popular travel series on public television, a weekly national public radio show, a weekly syndicated column, and free travel information available through his travel center and ricksteves.com. Rick Steves' Europe also runs a successful European tour program organizing small-group tours that take more than 30,000 travelers to Europe annually. His mission: to empower Americans to have European trips that are fun, affordable, and culturally broadening. Rick Steves' free resource for teachers and students includes more than 400 ad-free video clips from the Rick Steves' Europe TV show covering European history, art, culture, and geography. Visit classroom.ricksteves.com. Rick Steves’ free online video library helps teachers engage every student in European history, art, culture, and geography. Ad-free and packed with more than 400 teachable clips from Rick Steves' Europe TV episodes, teachers can search the video database, select any number of 3- to 5-minute clips, and build playlists to enhance their lesson plans. It's fast, fun, easy…and totally free. All are welcome to visit classroom.ricksteves.com — and enjoy. Rick Steves' free online video library helps teachers engage every student in European history, art, culture, and geography. Packed with more than 400 short clips (three to five minutes each) from Rick Steves' Europe TV episodes, teachers can search our ad-free video database, select any number of short clips, and build playlists to enhance their lesson plans. From touring the ancient Roman Forum to learning why people in Barcelona speak Catalan, to visiting a vibrant market in the south of France, to pondering why pilgrims trek 30 days across northern Spain to Santiago de Compostela, Rick personally selected his most teachable moments. It's fast, fun, easy…and totally free. All are welcome to visit classroom.ricksteves.com — and enjoy. Click on the images to view the full-sized, hi-res JPGs. Right-click on the download link to save the image. Rick doing book research in Bern, Switzerland. Rick filming his TV show in Scotland. Rick Steves Classroom Europe™ logo. Go to Rick’s post at www.facebook.com/ricksteves/posts/10156748988207745. 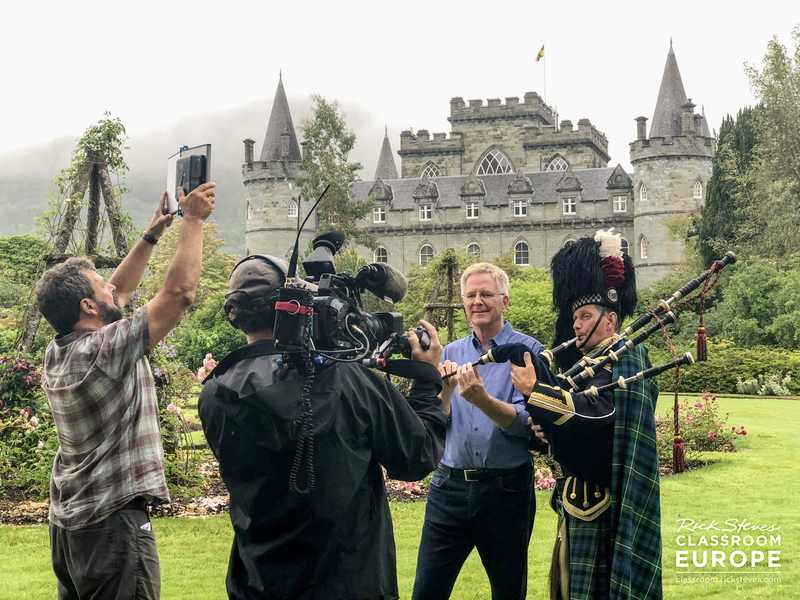 Check out Rick Steves’ free resource for teachers and students with more than 400 short video clips from the Rick Steves' Europe TV show covering European history, art, culture, and geography. – You could share why you are excited about this resource, how you’ve used it, or what you like most about it, or you could just keep things simple and express enthusiasm for the idea in general. – If your page is targeted to educators, you’ll want to encourage your followers to visit classroom.ricksteves.com and try it out for themselves. Or, if your audience is broader, you may want to suggest to your followers that they share this free resource with the teachers in their lives. – If your page represents a public television station, you may want to highlight the relationship between public television and education — and you could point out that this free resource is a wonderful example of how public television content can support the work of our nation’s teachers. Click “Post” — and you’re good-to-go. Looking for something quick and easy? Just go to https://twitter.com/RickSteves/status/1094985170007015428 and click the Retweet button. covering European history, art, culture, and geography. Note: If you start your tweet with “@RickSteves,” you’ll want to add a period before the @ so the tweet doesn’t become a reply. Post one of the images from the Promotional Images section above. Choose a pin at https://www.pinterest.com/ricksteves/teaching-resources/. Hover over the pin and expand the dropdown menu to select the board you want to save to — and click "save."